(Dale Duvall/Culpeper Times) Virginia Colonial history will be re-visited as horseback riders from across the United States gather to re-enact Colonial Governor Alexander Spotswood’s Transmontaine Expedition up and over the then imposing Blue Ridge Mountains. It was 300 years ago that this expedition paved the way and began the never ending westward expansion of America. Starting Aug. 23, the ride, which became known as the Expedition of the Knights of the Golden Horseshoe will be re-enacted by horseriders and historians. The ride is organized and led by Best of America by Horseback, a nationwide sponsor of scenic and historic trail rides and producer of the Best of America by Horseback Television Show. Executive Producer and host is Culpeper’s own Tom Seay, owner of Andora Farm, a working farm that is truly an important part of Culpeper and The Old Dominion History. Some elements of the ride will feature period costumes which will complement the production of a television program that is being produced for national broadcasting later this year. The public is invited to watch and observe the ride and to attend a variety of events and ceremonies along the way. Thursday, Aug. 25, 5 p.m. to 8 p.m., cook-out dinner, music, mixing and mingling with riders, photo ops, games, historic characters in costume, storytelling at Andora Farm, 17275 Germanna Highway. Tickets and details available at the Museum of Culpeper History. Friday, Aug. 26, at lunchtime, the riders will visit and tour the historic Hebron Valley Lutheran Church. Saturday, Aug. 27, the ride will commence and proceed up the mountains from Graves Mountain Lodge to a noon time ceremony at Big Meadows, sponsored by The National Park Service and The Daughters of American Colonists. At 1 p.m., a Point of Proclamation Ceremony will be held in the Lodge at Big Meadows. That ceremony will conclude the official re-enactment of the Expedition of the Knights of the Golden Horseshoe. Big Meadows is accessible at Mile Marker 51 along the Skyline Drive. Skyline Drive access fees have been waived for this weekend. 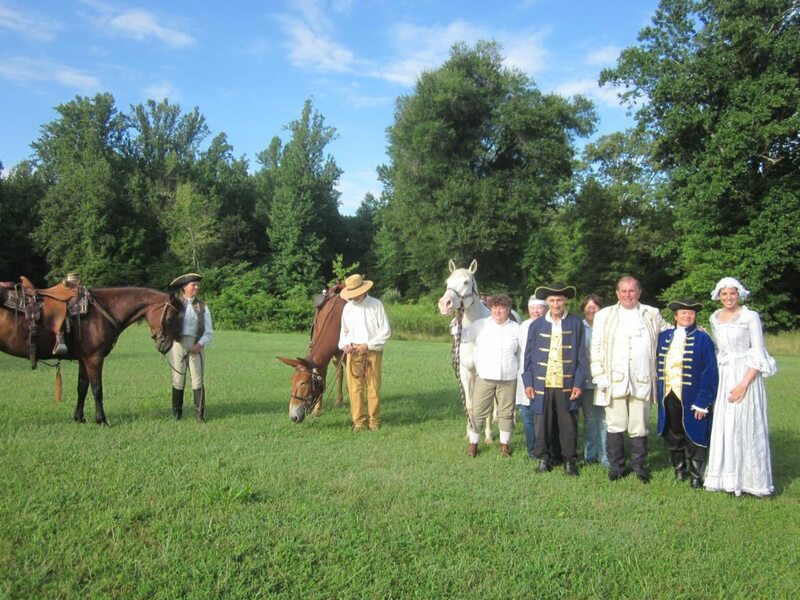 This re-enactment ride commemorates the original ride which was undertaken from the Germanna Colony because, at that time, Germanna represented the western frontier of the Virginia Colony. The significance of that historic ride is evidenced by the fact that it created new horizons. Settlers immediately began seeking opportunities there for families, farms, and businesses. Within one decade, the non-Indian population living in the Shenandoah region had grown to more than 10,000 people. Direct questions to the Museum of Culpeper History’s Director Lee Langston-Harrison at 540-829-5954 or Board Member Dale Duvall at 540-547-2373. A cool morning, cool costumes and an enthusiastic crowd gathered at the Germanna Foundation in Locust Grove Tuesday morning for the send off of a very special group of riders. They were there to commemorate the 300th anniversary of the Knights of the Golden Horseshoe expedition led by Governor Alexander Spotswood in 1716. That ride not only took the intrepid group to the top of the Blue Ridge Mountains but paved the way for English colonization beyond that terrain. Keep in mind that the French were also vying for territory at the time but Spotswood had creative plans and an eye toward westward expansion. Who better to lead the group than Culpeper’s own Tom Seay perhaps most famously known for his Best of America by Horseback program. Seay, along with his niece and co-host production coordinator Kristen Biscoe, are descendants of the original German settlers that occupied this area so for them a very unique ride. “I’ve ridden in Mexico, Canada and many areas but this is home. I love my Virginia. When I was five, I rode to school on a shetland pony. When I got there, the pony would return to the barn on his own. In the distance I would see those Blue Ridge Mountains and it was my dream to ride there on my pony. Now, I’m living that dream of a 5-year-old,” said Seay as he looked to the forest they would soon enter. It was from this spot at the Germanna Foundation that the original group ventured out.